In a boost for Tamahere conservation projects two teams of professionals weighed in to help the efforts of hardworking local volunteers today. 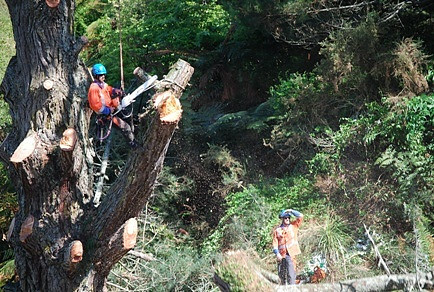 In the reserve below the Allan Turner Bridge on Woodcock Rd, arborists displayed their awe inspiring skills by painstakingly sawing down a 30 metre pine tree that threatened both the bridge and nearby power lines. 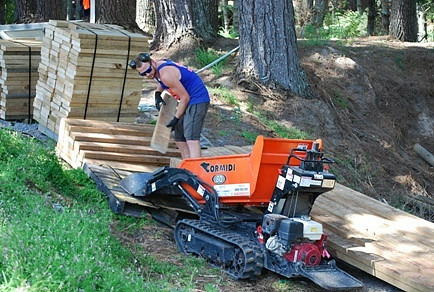 Meanwhile, in the Tamahere Reserve on Tauwhare Rd a construction team began work on a boardwalk which will stretch around 200m into the reserve. The arborists, from WEL Energy, spent most of the day carefully cutting big branch after branch from the pine tree to reduce it to a limbless trunk that could be safely dropped. The tree’s top had died, making it a potential danger to the power lines, the bridge and anyone in the reserve below. 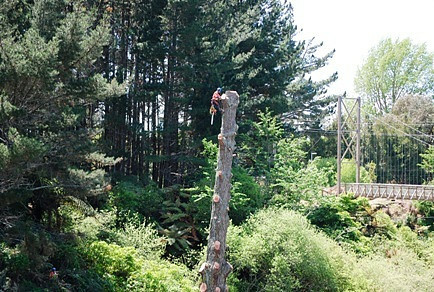 The tree-felling work stopped bridge users in their tracks as one arborist swung from ropes high in the tree while improbably wielding a roaring chainsaw to cut branches that were themselves the size of large trees. 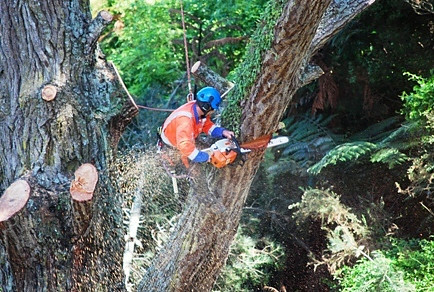 The second arborist worked at ground level cutting up the dropped limbs while showing supreme confidence in his workmate’s ability to drop them to the ground with seeming pin point accuracy. A 10m length of the trunk was left standing because as it rots the insects that help along the decaying process will be food for birds. 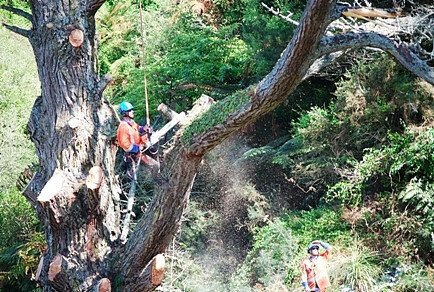 While the tree came down at one end of Woodcock Rd at the other, in the Tamahere Reserve, staff of Walkways Solutions were busy driving in support posts and transporting decking timber around the site. The $50,000 worth of funding for the boardwalk has been provided by the Waikato District Council. Leo Koppens, chairman of the Tamahere-Mangaone Restoration Trust which is restoring the reserve, is delighted the work has got underway after the grant for the work was announced in June. The boardwalks will be a metre wide and could stretch up to 200m alongside the Mangaone Stream, providing safer access across wet areas and allowing visitors to connect with the stream. For more information on the Tamahere Reserve click here. Timber for the Tamahere Reserve boardwalk being taken to the site.